Worried about how you will manage as the one of the undead? 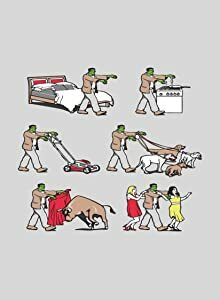 If you know anything about zombies, you know being undead comes with its own special set of needs. Don't inevitable rot and decay slow you down. Not bitten yet? Check out our article on Zombie Proofing and Defense! Find the supplies you need to protect yourself from a zombie attack! But, once you are bitten - I have compiled a list to help you out, with everything you will need to keep yourself in one piece. • Caulk - Need to do quick repairs while on the shuffle? Check out these adhesives and caulks for all of your loose arms and legs, and rotting flesh. • Duct Tape - Of course, you already know duct tape works for everything! • Sealants - You might be able to prevent further and unnecessary decay with these waterproof sealers. • Bolts and Fasteners - Those broken bones and dangling limbs will slow you down even further! Make sure to be prepared with your own supply of bolts and fasteners. Just because your flesh is rotting and falling off doesn't mean your home has to stink. Here is everything you might need for your zombie home maintenance, so you can keep up with the Jones, I mean the living! • Air Fresheners - You don't have to smell undead, when you wear one of these air fresheners around your neck. Although you might need a couple dozen! • Carpet Cleaners - Make your home fresh again by removing those pesky blood and dropped rotting flesh stains! • Cleaning Supplies - You may find you are a bit more clumsy now that you are undead, so stock up on cleaning supplies to clean up the inevitable messes you will make. • Fly Paper - I don't know what it is about the undead, but flies seem to love you! Keep away those swarming flies at bay, by wrapping yourself with fly paper and cut it off when full. • Stain Sealers - feeling washed out, and missing that healthy tan? Check out these stain sealers in a wide range of colours, specially formulated to ensure ease of application, and enhancing your natural beauty! • No Hunting Signs - Keep away those crazy still-living with a handy sign to remind them YOUR property is a no-hunting zone. • Shovels - Having trouble making friends after you've risen? Grab a shovel, and you can dig up a few friends in no time! • Wagons - Sometimes your undead legs stop working, but if you have yourself a wagon, your newly dug up friends might be willing to pull you around! • Other Mobility Devices - No friends? Then make sure you have your own mobility device, and you can keep going till the power runs out! 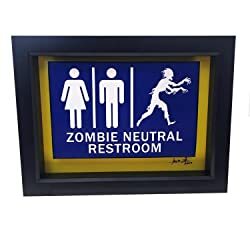 Don't be scared of your new zombie unlifestyle!